With higher levels of qualifications and experience, exclusive Arizona buyer agents exclusively represent the buyer to offer premium service, protection and results. That’s why we’re aptly named Exclusive Arizona Buyers Agents. 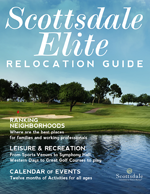 We specialize not only in locating luxury real estate for buyers (whether they’re from outside Arizona or down the street) but also in the unique aspects of the Arizona lifestyle, and the high-end way of life for families in Scottsdale communities, school districts and businesses. We are uniquely qualified to perform services the seller's agent can't, such as provide solid reasons not to buy a particular property; negotiate the best price and terms; include contingencies in the contract for protection, rather than the seller as in most standard contracts; and strengthen the bargaining position of Scottsdale luxury home buyers. Because of our elite level of training, Exclusive Arizona Buyers Agents provide expert representation exclusively to buyers to protect your interests with the utmost good faith, loyalty and fidelity. Buying a Scottsdale luxury home is far more than a real estate transaction; it’s about the preservation and growth of family assets, building long-term value and maximizing personal equity and the critical need to protect them. A specialized buyer brokerage, such as Exclusive Arizona Buyers Agents, provides these protections to ensure a superior Arizona luxury real estate home buying experience.